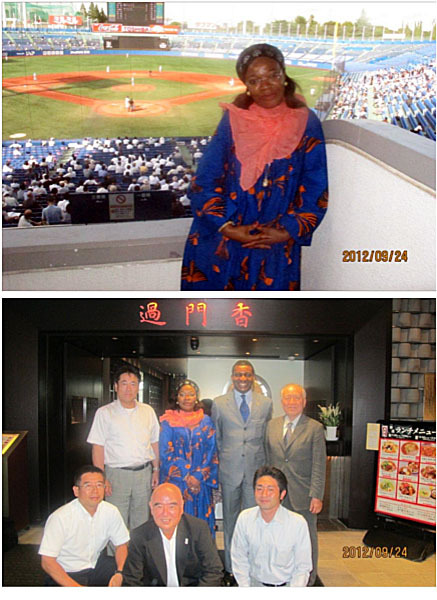 Francoise Kameni Lele, Vice President of Baseball and Softball Federation of Cameroon and a member of International Softball Federation’s Task Force was the guest of honor at the luncheon jointly hosted by the officials of Baseball Federation of Japan and Japan Softball Association in Tokyo on September 24, 2012. She was former Treasurer of African Baseball and Softball Association. They exchanged views wide range of subjects including reinstatement of Baseball and Softball to 2020 Olympics and promotion of both sports in Africa. Afterward she visited Meiji Jingu Baseball Stadium to watch a college baseball game between Meiji University and Waseda University, members of the Tokyo Big-6. On September 25, she called on the Japan International Corporation Agency (JICA) with IBAF 1st Vice President Kazuhiro TAWA and BFJ Deputy Secretary General Yutaka Shibata. JICA sends out about 500 Overseas Cooperation Volunteers every year mainly to help development of agricultural and education areas and 22 baseball and softball coaches from Japan are currently stationed overseas including 2 in Africa. She came to Tokyo primarily to attend the JATA Tourism Forum & Travel Showcase in her capacity as Cameroon Chapter President of Africa Travel Association to accompany the Ministry of Tourism.